Last week I was strolling through Walmart, which happens to be one of my least favorite stores on the planet. The dim lighting and lack of decent produce coupled with a maximum of 3 open lanes stacked 10 people deep is enough to make me stay away – forever. However, I was on a mission to find a specific item for a cupcake idea. A mission that was fully provoked by Amber, who led me on a wild goose chase via the phone. After asking several employees and Amber’s diligent Googling from New Jersey, I still came up empty handed. It appears that we Ohioans are a little late to the Orange Creamsicle Oreo scene. Instead of fleeing at that moment, I decided to do what any baker would do, I went to assess their baking aisle where I stumbled upon a lonely bag of Toasted Coconut Marshmallows. Being that I love coconut, especially of the toasted variety, and marshmallows, I immediately snatched them up along with a giant box of Kellogg’s Rice Krispies. Hello, Toasted Marshmallow Rice Krispie Treats! I wanted to love these marshmallows – I really did. However, I can only equate the experience to eating a marshmallow that’s been coated in coconut flavored sand. Not the best mouth feel in the world and sandy Rice Krispie Treats sound less than delicious. 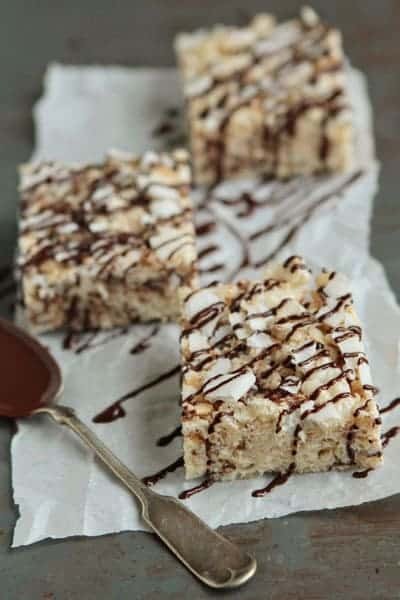 Lucky for me, I had a full bag of plain miniature marshmallows stashed away in the pantry, so I created my own version of Toasted Coconut Rice Krispie Treats and added a little chocolate into the mix just to kick things up a notch. The result? Oooey, gooey crispy marshmallow goodness enhanced by the subtle flavor of coconut and flecks of chocolate. A definite win and totally worth waiting 15 minutes in line at Walmart for the inspiration. 1. Line a 9 x 13 x 2 inch baking pan with foil and spray with nonstick cooking spray. 2. In large saucepan melt butter over low heat. Add marshmallows and stir until completely melted. Remove from heat and stir in coconut extract. 4. Using buttered spatula, press the mixture into the prepared pan. Cool. Cut into 2-inch squares. - Chocolate-Coconut Rice Krispie Treats are best if served the same day they are made. - To Toast Coconut: Preheat oven to 350 F. Spread shredded, flaked, or shaved coconut on a rimmed baking sheet. Bake in preheated oven, stirring often, until golden brown - about 5 to 10 minutes. - I drizzled my bars with melted chocolate before serving. These look awesome…. and since Rice Krispies now makes a gluten-free version, I can make it (yay!). These are definitely getting made for a beach picnic or potluck this summer… thanks for the inspiration! Ooo, fancy rice krispies! I LIKE!! ♥ I totally agree with you on the Walmart thing, but hey, if it gives you inspiration to make good food…let them come! this is my perfect dessert: I love RKTreats and I love coconut! (and no-bake!) Gorgeous! Umm hello! You survived wal-mart and you showed it who’s boss!! Sad about the disappointing mallows. There have been a lot of new flavors our recently (I liked the gingerbread ones in my hot chocolate this winter) that I think are great for Krispy Treats. These looks great and I am a huge fan of anything no bake in the summer time! Thanks for sharing! This sounds like a dream! 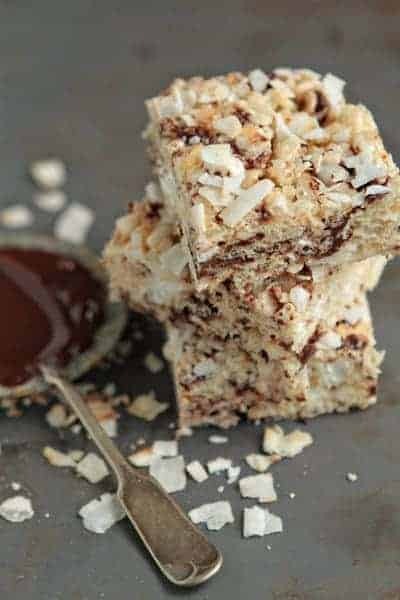 I love the combination of chocolate and coconut, so by adding it to a rice krispit treat must create the perfect crunchy sweet treat! Voted for you. Hope you’ll win the contest. Good that you made your Walmart trip worthwhile….I totally understand why you dislike shopping there. What a wonderful idea to make a coconut rice krispie treat. I’ve tried many different versions but never with coconut! It must be so tropical, and so fitting to the hot summer days we’ve been having in LA! Why hello there, lovely. How are you this fine morning? Perhaps you would go nicely with my cup of coffee. I think so, yes. I feel the absolute same way about Wal-Mart. Have you ever seen the Wal-Mart Bingo that floats around the internet? It is hilarious! You’d get a laugh out of it. These look yum,you cant go wrong with RKT! I always love your photos! im poping over to pinterest right now. Awww yeah. So yummy looking! These sounds delicious, I can’t resist anything with coconut! But I see you are from Ohio like me, so I must tell you I saw Creamsicle Oreos at Giant Eagle. Thanks for the tip, Robin! Yum, yum, yum! One of the best cominations is chocolate and peanut butter! Great recipe! What a great recipe – and thank you for using butter. I detest when someone makes krispie treats with margarine. i love these little treats.. which dont take much effort or technique.. but you knwo they are always a winner!! these are simply awesome!! I love rice krispie variations! Mmm I love the toasted coconut addition. I love rice krispie treats! I love this variation on a rice krispie treat! I feel the same way about Wal-Mart; it can be dreadful. I love your finished version. Great things happen from strange occurrences sometimes. BTW seriously I’ve been wanting those creamsicle oreos and haven’t seen them either… and we never got the neapolitan ones either! These look delicious! And, I have never heard of Orange Creamsicle Oreos! We somehow missed the birthday cake Oreos here too, so I feel your pain. I didn’t even know those Oreos existed. These treats are a good alternative, nonetheless. Thanks for sharing! Hummm, me gusta el coco. Coconut in rice krispie treats are out of this world delicious, aren’t they? Love these! The orange creamsicle Oreos do exist in Ohio – I got some last weekend. I got them at Giant Eagle grocery store but I bet Target will get them too – Target is pretty good about having exotic Oreo flavors. I’m not surprised WalMart didnt have them – that place stocks for the masses. 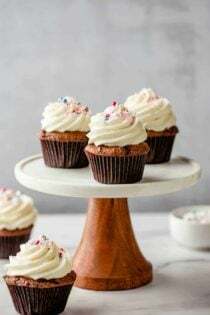 If you are brewing up a orange creamsicle oreo cupcake creatin, please count me in – I absolutely love orange creamsicles! Hope you find the cookies! I voted for your picture 1. because I love your blog and 2. I really do think it’s the best one! Thanks so much, Julie! You just made my night! These sound so good, I’ve been on a coconut kick for a few years now – seriously addicted to coconut creme coffee creamer, but that’s another story. I wanted to ask about your photo… the chocolate looks more like veins running through the bar than chips? Did they melt? Was wondering if you did that on purpose. Either way, yum! Since the marshmallows are warm, the mini chocolate chips will melt a bit which is why they appear the way they do in the photo. Hope this helps. Happy baking! Chocolate and coconut are always a winning combination! 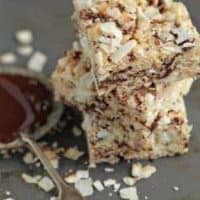 A cross between an Almond Joy and a Rice Krispie Treat?! I know what I’m making next. what about subbing coconut oil for the butter? More coconut flavor for sure but would it gel well? I have not tried subbing coconut oil, but if you do, let me know how it goes! Thanks for stopping by. I can’t wait to try these! I absolutely love coconut and also enjoy toasted coconut marshmallows (non-Walmart variety). Thanks for this fantastic recipe… perfect for a summer get together and definitely brings back memories of my childhood. PS: If you LOVE coconut – I made some delicious Double Chocolate Almond Joy Brownie Bars that I posted on my blog a few weeks ago…. TO. DIE. FOR. The wow factor on these treats are at a full 10! One childhood treat I still love is Rice Krispie Treats; with chocolate and coconut? Help. I’m actually doing a RK treat soon; friend sent me an AMAZING thing on a stick from a local store in my hometown of St. Louis…now I have to figure out how to make it so there will be no more overnight shipping to the tune of $28. Not kidding. I have always been a HUGE fan of RKT’s, but these were seriously delicious! Only problem I had was getting the chocolate chips to mix in well and stick. Next time I make these I will try mixing the chocolate with the melted marshmellows first. Thanks for the amazing recipe! Why are we reserving the 3/4 c marshmallows? Has anyone used the coconut oil in place of butter? I will be making this for our church senior banquet. Hope it works! You add the reserved marshmallows in with the chocolate chips, just for a little more texture in the treats. I have not tried these with coconut oil but let me know how they turn out if you try it. Thanks for visiting.